Age is just a number. You're never too old to rock n roll. You can't teach an old dog new tricks. Let's just skip that one. 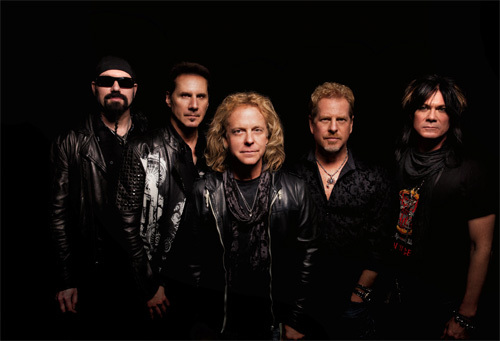 Night Ranger, the music video kings of the early Eighties, have been recording and performing for 35 years. Wow. That's historic, considering the half life an average band. 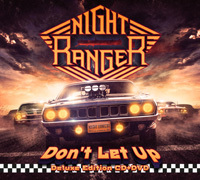 For this anniversary Night Ranger drops their twelfth album, Don't Let Up. Something of a message in that title? I think so. Here's my thing with Night Ranger. Sister Christian aside, I wasn't much of a fan or follower of the band. But I did keep some interest during those meat and potato days of ten video hits. My observation back then, and it still remains the same, is that Night Ranger never fit the whole glam or sleaze rock mold of the Sunset Strip Eighties. Nah. They were never as glossy as, say, Bon Jovi or Poison, or slippery smutty like Motley Crue. I simply thought of them as a good times, kegger on the patio, friends down with some grillin' and chillin', rock and roll band. That pretty much describes the Night Ranger now and the music within Don't Let Up. To do so, Night Ranger works from the usual musical elements: tight and catchy melodies, twin guitar harmony with ripping leads, hooks in refrains and riffage, some sweet vocal harmony, and smart rock groove from the rhythm section. Then they drop all these things in AOR arena-ready wrapper. Heavy, often swift, rockers come with Say What You Want, Day And Night, and Running Out Of Time, by example. Starting with an acoustic guitar line, Truth rocks but with a more mid-tempo movement and offers some signature Night Ranger vocal harmonies. Alternatively, some latent blues groove informs the guitar lines of (Won't Be Your) Fool Again. Returning to the acoustic side, We Can Work It Out and Nothing Left Of Yesterday offer some lighter fair. The former turns largely on the acoustic guitar and vocal harmonies, but will hook you with the pleasing chorus. Similar, the latter song juxtaposes calmer acoustic moments with larger and deeper riffs and groove, and the vocal arrangement is bolder. The only bummer was Jamie. Yeah, it rocks, but what is it about classic rock bands having to have a song about a chick (I think it's a chick) with a one word title. (Rolling Stones: Angie; Toto: Rosaanna. By example. Groan.) That was just for grins. Again, almost by textbook definition, Night Ranger is a classic, good times, melodic hard rock band in AOR wrapper, and with Don't Let Up they deliver the consistent rock and roll magic they've been doing for 35 years. Don't let up, fellas. Easily recommended. Almost by textbook definition, Night Ranger is a classic melodic hard rock band in AOR wrapper, and with Don't Let Up they deliver the consistent rock and roll magic they've been doing for 35 years. Don't let up, fellas. Easily recommended.